Whether you're roughing it or enjoying the woods in style, if you're in the Whiteface Region you've come to the right place. The campgrounds here can get you the wilderness experience you seek — even if that means getting breakfast delivered to your tent. 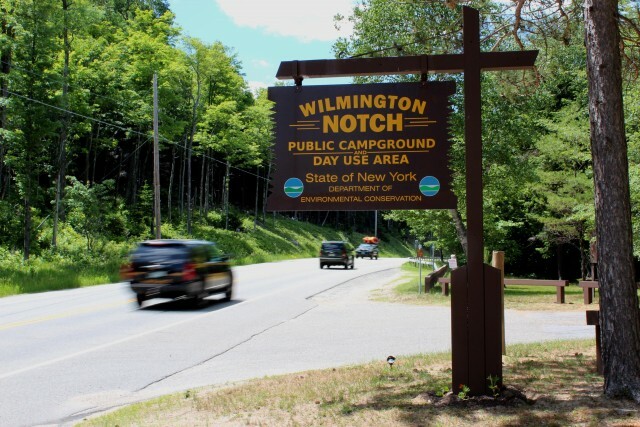 If you want a primitive camping experience with some basic amenities thrown in on the side, the Wilmington Notch State Campground is for you. You won't find electricity at any of the campground's 54 sites, but you will find an experience that's close to nature, and close to running water and bathrooms. 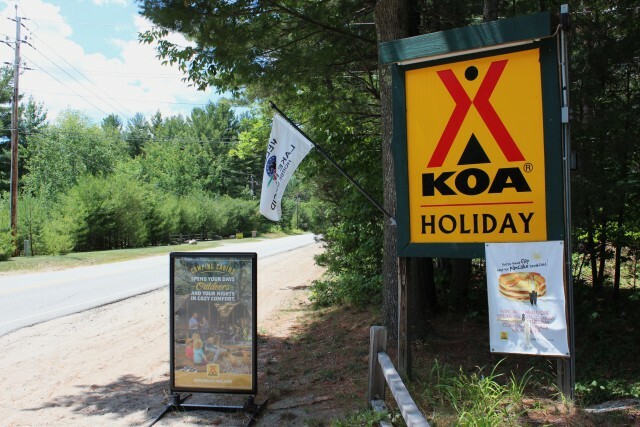 The campground is located in Wilmington Notch, a deep, rugged pass between the Wilmington and Sentinel mountain ranges, and is a mere 30-second drive from Whiteface Mountain Ski Center. The entire area is lined with cliffs that plunge down to the raging West Branch of the Ausable River. From the back of the campground there's a trail that leads to a hidden, unnamed waterfall. Carefully follow the path as it steeply descends beneath a forest canopy of hemlock and red spruce. Near the bottom of the hill you'll be faced with three options — right leads to a rocky protrusion with an excellent view of the falls, left goes to the river's edge above the falls, and straight goes down a rocky path to the base of the falls. Be aware that there are plenty of places to slip, but that can easily be avoided by proceeding slowly. So be safe and enjoy the view! The main lodge is homebase for the campground. There's a grocery store, gift shop, general store, miniature golf course, arcade, play area, heated swimming pool, craft center, laundry mat, and dining hall. Breakfast is served daily on the second floor of the lodge, and it can also be delivered right to your campsite. 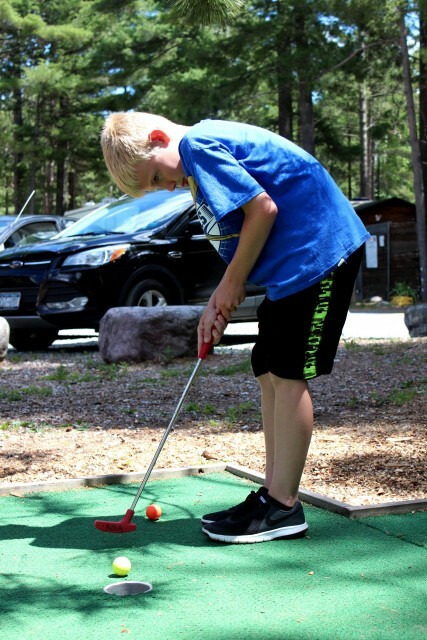 The grounds have sites with electric and water hookups, a pet walk, a large bonfire area, and paths that lead to the West Branch of the Ausable River and the Wilmington Flume, a must-see display of raging water, a deep gorge, and swimming holes. And if skiing or boarding is your thing, this campground now rents heated cabins in the winter. 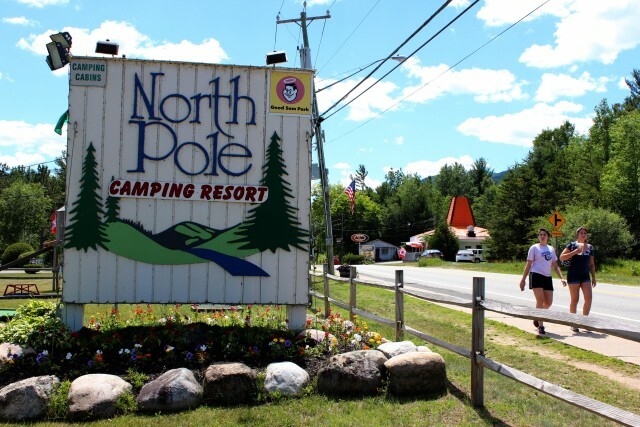 The North Pole Resorts have a bit of everything for everyone. The family-owned grounds have whatever accommodations you desire: tent sites, RV sites with full hookups, private cabins, and a 20-room inn. But you came to camp, right? The sprawling resort's campgrounds are spread over two sites, the resort section and the 100 Acre Woods. The resort section is closer to amenities and has easy access to the Ausable River, whith rental boats available. There's also a miniature golf course, two in-ground swimming pools, general store, gift shop, liquor store, laundry facilities, gemstone and fossil mining sluice, a group hall with kitchen facilities, and the best beer selection around. There's even a super-cheap beer of the week. The 100 Acre Woods section is just down the road. It offers a more secluded camping experience than its resort counterpart and provides easy access to miles of mountain biking and hiking trails that connect to state land. Even though there's more space between the sites here, 100 Acre Woods still has some basic amenities including full hook-up sites, a playground, game room, and laundry room. It's also across the road from the Wilmington Town Beach, which is free to use! When camping in the Whiteface Region, you're never far from fun events, attractions, dining, and hiking.